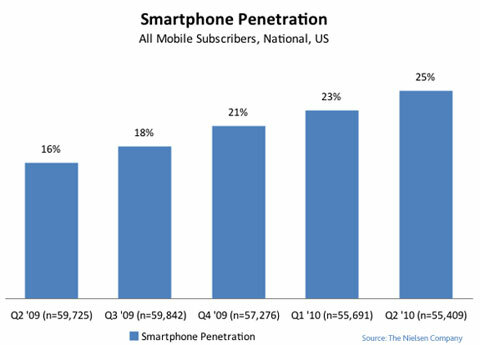 The Nielsen report said that “among current subscribers thinking of switching” mobile phones, 90 percent of iPhone owners remain loyal to the handset. With the introduction of the iPhone, Steve Jobs achieved something that might be unique in the history of business: he single-handedly upended the power structure of a major industry. In the US, before the iPhone, the carriers (Verizon, AT&T, Sprint, T-Mobile) had an ironclad grip on the rest of the value chain – particularly, handset makers and app makers. 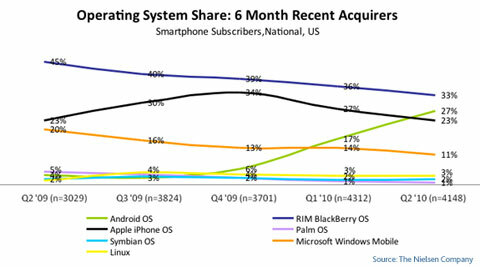 Post-iPhone, tens of millions of people started choosing handsets over carriers. The basis of competition was salesmanship and capital, not innovation or quality. At a lunch recently, I found myself sitting next to a Telefónica executive in Mexico, where iPhones and Androids haven’t really taken off yet. We struck up a conversation, and I was showing him the Foursquare iPhone app (I work at Foursquare). He said the app looked cool and asked me what carriers we had deals with. When I said we didn’t do deals with carriers–that we just developed for platforms and ran on any carrier–his eyes widened a bit. Then he asked me how much we had to pay each time someone used the geolocation feature. (Telefónica in Mexico provides a geolocation service on their phones, but they charge consumers for every use.) When I said we didn’t have to pay, that it was provided by the platform and for free, he was visibly shocked.